Posted by Commodore Mendez in Star Trek. Yes, the great debate rages on: You got your white Vulcans. You got your black Vulcans. So why no Puerto Rican Vulcans? My name is Commodore Mendez and I am a Latino Trekkie. And I am not alone! Note to Hollywood producers: Just because Hispanic characters are extremely rare in the franchise does not mean I cannot be enamored of it. Believe me, I enjoy the little half-assed pandering you do do (Captain Castillo indeed!). I ate always ate dinner in front of the TV, my third and favorite parent. (Don’t worry, mom and dad don’t have web access.) Coming home from school, I did my homework immediately, not to be studious, but to be able to watch without a single impediment. “Did you do your homework?” mother screamed. “Yes,” I mumbled, entranced by the gray worlds pulsing in front of me. So I saw Kirk, Spock, and McCoy more than I did any uncles, aunts, or cousins, most of whom lived in faraway lands called Chicago and Ponce. 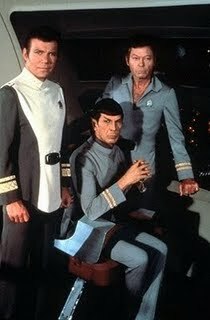 Kirk, Spock, and McCoy became, like so many TV characters to so many TV watchers, family. Better than family, in fact, because they didn’t come over without calling and drink the last of your Yoo-hoo. But even after watching them for years like that, I still would not have called myself a Trekkie. But then Wrath of Khan came out just as I finished high school. In fact, if memory serves, I went with my friends Phil Lee, Henry Yee, and Frank Kugler to see it in theaters. There was something about that movie, and something about seeing those family members again, that brought me closer to being a Trekkie. I still wasn’t there yet. That would take a few more movies. And some bad TV spinoffs.